The Happy Whisk: True or False? Was able to keep both going in opposite directions for about 10 seconds or so, then the foot started wiggling. Got it straightened out and going clockwise again, and the hand started wiggling. I should get back to playing drums again. It might help! Hahaha. These are great comments. Thanks for playing. Very funny stuff. I thought I could to, and I did for a wee bit. But then, the leg went. Fun stuff. Thanks for playing. This was fun. I made it one rotation. Stupid foot. Hahahahahahaha. I laughed out loud when I read your comment. Stupid foot. It's been great fun reading these comments. Yes, so true. You can successfully fight it, but it takes effort. It does at that. I wasn't able to keep it going very long, then I got it back and then I lost it again. Haha! This hurts my brain as much as it makes me giggly. Thank you, Whisk. Sure thing. Thanks for playing. I'll be dammed. Tis true. 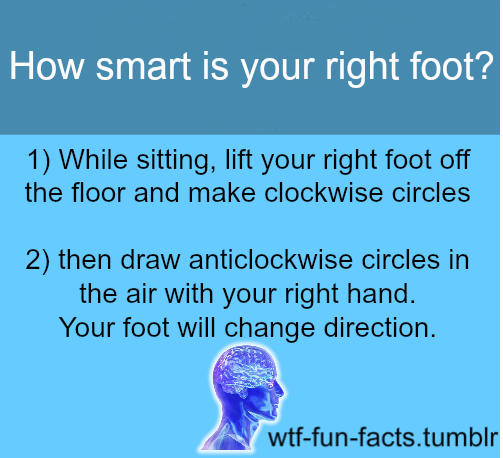 My feet are both inexcusably stupid! lololol. Hope you're feeling better. I was playing catch-up on the blogs and saw that you were sick. You are one talented Chickie.